For thirty years, chimpanzees kept at the Liberian Institute for Biomedical Research served as research subjects for hepatitis B vaccine studies conducted by the New York Blood Center. In 2006, the blood center halted its experiments, retiring the apes to six nearby islands within an estuarine habitat with extensive mangrove forests. For nearly a decade, former lab staff cared for the animals, which were wholly dependent on humans for food and fresh water. Then, in March 2015, the blood center cut off all funds. The staff—who kept on caring for the chimps, unpaid—knew all the animals were likely to die if they couldn’t find anyone to help. No one knows what would have happened if not for the recent Ebola outbreak in West Africa, which started in Guinea in December 2013 and raged across the neighboring countries of Liberia and Sierra Leone, killing more than 11,000 people. Because the former hepatitis research operation was one of the few laboratories in Liberia—a nation torn apart by a 14-year civil war—researchers from international health agencies used it to conduct Ebola research. The chimpanzees’ head caretaker, Joseph Thomas, who had worked with the animals since the 1970s, brought visiting scientists out on his boat to witness the chimps’ distress firsthand, and begged them for money to buy both food and the fuel needed to bring it to the animals. One of those scientists alerted the Humane Society of the United States (HSUS). 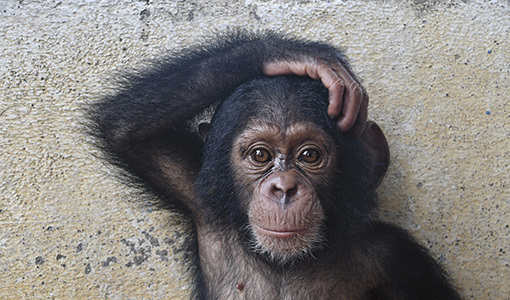 The HSUS and a coalition of 40 organizations responded by trying to find someone to manage the chimps on-site and soon found that the short list of qualified people was short indeed, said Doug Cress, then the director of the United Nations’ Great Ape Survival Project. At the top of that list were Jim and Jenny Desmond: Over fifteen years, they had cared for gorillas, orangutans, chimpanzees, monkeys, and other primates at eight sanctuaries in seven countries around the world. When several organizations came together to create a sanctuary for eastern lowland gorillas in Democratic Republic of the Congo, Cress had recommended the Desmonds because they could whip up community support like no one else, even from such a remote facility: on top of a mountain, miles from the nearest city or airfield, the nearest neighbors often rebel armies. Just as important as that experience, Cress said, was that the couple knew when they’d need to adjust their approach for an entirely new climate. But as it turned out, the plight of the former lab chimps wasn’t the only crisis to contend with in Liberia. 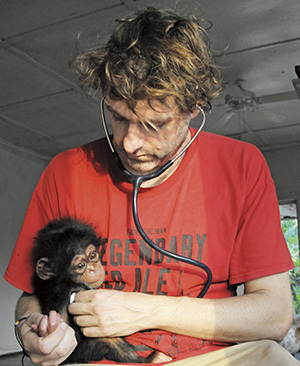 During a five-week intervention Jim and Jenny undertook before signing on to the job, something unexpected happened: Locals brought them two infant chimps that had been kept as pets in deplorable conditions. Over time, more and more came in—today, 17 of them have been confiscated by the Forestry Development Authority, the government agency tasked with protecting wildlife and enforcing wildlife laws in Liberia. Most of the animals are only two or three years old, and all are victims of poachers illegally hunting adult chimpanzees for meat and selling their young offspring as pets. The orphaned chimps’ history is not just tragic; it’s also a troubling indicator of what lies ahead for western chimpanzees, a critically endangered subspecies that saw its numbers in the wild decline by 80 percent between 1990 and 2014. The Desmonds came to understand that they were ideally situated to help combat the problem. First, they had the vast stores of experience they would need to help build a sanctuary for the chimps from the ground up. Second, they happened to be in one of the best possible places for such a sanctuary to be built. The years of unrest in Liberia has meant that much of the chimpanzees’ habitat there has been protected from development. Of the roughly thirty-five thousand western chimpanzees that still live in West Africa, seven thousand are estimated to inhabit this one small country. “It’s the only country in West Africa where large tracts of the Upper Guinean forests still remain intact,” Jim said. So today, more than two years after setting foot in the war-torn nation, Jim and Jenny have no plans to leave. Liberia: Come for the desperate chimps abandoned on mangrove islands, stay for the desperate chimps orphaned by poachers—it’s not a pitch for a kind of life most people would find irresistible. But the Desmonds aren’t most people. Anyone looking in from the outside would assume that Jim and Jenny have always worked in wildlife conservation. But Jim was a well-paid recent chemistry grad employed in pharma in 1994 when he met Jenny, who was leading trainings on large-scale fund-raising around the U.S. Within a year after meeting, the two married. Their lives changed course on an around-the-world honeymoon. At an orangutan sanctuary in Borneo, Jim met Annelisa Kilbourn, V96, who was working with veterinarian William Karesh and virologist Nathan Wolfe to look for diseases that great apes might pass on to humans and vice versa. (Kilbourn, whose research provided the first evidence that Ebola threatened wild gorillas, died in a 2002 plane crash.) Jim couldn’t stop thinking about the encounter. If he could do the kind of work that Kilbourn was doing, he could apply his scientific mind to a cause he felt passionate about. But first he would need to go to veterinary school to build the proper foundation. Jim was determined to go to Cummings School, and when he didn’t get in on his first try, he turned down an acceptance from another respected veterinary school to reapply. “If you wanted a different kind of career in veterinary medicine, Tufts was the place to go,” he said. After he was accepted to Cummings in 2003, he enrolled in a dual-degree program that allows students to earn a D.V.M. alongside a master’s in comparative biomedical sciences over five years. A Dr. Henry L. Foster Scholarship helped Jim pursue his new path by lessening some of his debt. A year after graduating in 2008, Jim landed his dream job with EcoHealth Alliance, which conducts international research into the relationships between wildlife, ecosystems, and human health. For six years, he and Jenny spent months at a time in China, Indonesia, and Myanmar while Jim tested domestic animals for pathogens, conducted avian influenza surveillance, and investigated wildlife markets as sources of animal diseases that could spread to people. The Desmonds also became the Pan African Sanctuary Alliance’s go-to unit in times of crisis. “It just seemed there was no task too big for those two,” said Cress, who served as executive director for the association of primate rescue centers and sanctuaries across Africa. 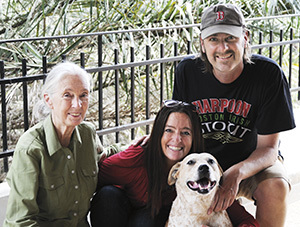 In 2015, the HSUS approached the couple, then working in Kenya, about the position in Liberia. “We didn’t say yes right away,” said Jim, explaining that they were happy in Kenya and had just been offered a job managing a conservation center there. But a five-week intervention turned into a yearlong contract with the HSUS, and then another. In May 2017, the HSUS came to an agreement with the blood center. 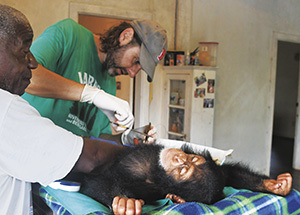 The HSUS would assume lifetime care of the lab chimps, supported by $6 million from the blood center. Five months later, the Desmonds’ second consulting contract with the HSUS ended and was not renewed. They decided to stay in Liberia anyway. EcoHealth in November 2015 had tapped Jim to lead a new project there aimed at finding the species that keeps the Ebola virus circulating in nature between outbreaks in humans. And they were devoted to helping the orphaned wild chimpanzees. Much work remains to be done, but there are encouraging signs. Liberia passed a wildlife law at the end of 2016, and a group is now writing the regulations that will govern its implementation. And Jenny, who serves on a law-enforcement task force, has written grant applications for money to train the Forestry Development Authority on fighting trafficking activities. Contact Genevieve Rajewski, the editor of this magazine, at genevieve.rajewski@tufts.edu. A scientist explores how genetics and experience shape the canine mind.